A new state budget Gov. Brown proposed last week does not have a long-sought rate hike for CalSTRS, which is projected to run out of money in three decades. But the budget does call for talks with teachers, schools and others to work out a rate-hike plan. Most California public pension funds have the power to raise annual employer rates when they need more money. The California State Teachers Retirement System, a century old this year, is an outlier that needs legislation to raise rates. As lawmakers at the Capitol struggled with budget cuts during a deep economic recession, pleas for a CalSTRS rate increase were not acknowledged with a legislative hearing until last year. Now the rate hike needed to project full CalSTRS funding in 30 years has ballooned to an additional $4.5 billion a year, nearly doubling the $6 billion received from current rates and a big bite from the $107 billion proposed state general fund. The budget calls for a CalSTRS plan that would not be enacted until fiscal 2015-16 and then phased in over several years. Among the issues is whether the rate hike would be part of the Proposition 98 school-funding guarantee. Another issue is how the rate hike would be split among the three CalSTRS contributors. The state currently contributes 5 percent of pay, school districts and community colleges 8.25 percent of pay, and teachers 8 percent of pay. The governor’s proposed budget said the long-term role of the state as a CalSTRS contributor “should be evaluated.” An end to direct state funding might open a discussion about whether CalSTRS should be given the power to raise employer rates. Hit hard by the recession like other pension funds, the CalSTRS investment portfolio dropped to $112 billion in 2009 and only recently climbed back to about $180 billion, the pre-crash peak reached more than six years ago in 2007. Part of the funding gap is self-inflicted. As a soaring stock market gave pension funds surpluses around 2000, CalSTRS joined the California Public Employees Retirement System in raising pension benefits and lowering contributions. 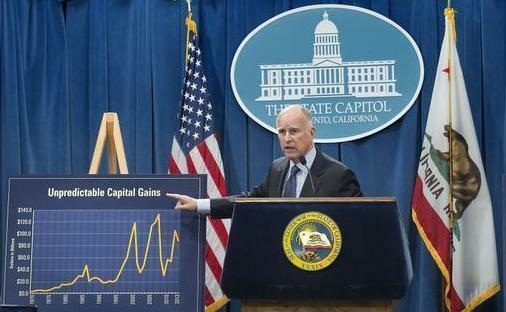 The state CalSTRS contribution was cut by more than 2 percent of pay. During a 10-year period that ended three years ago, a quarter of the teacher pension contribution, 2 percent of pay, was diverted into a new individual investment plan for teachers. About $5 billion was diverted from the troubled CalSTRS pension fund into the new Defined Benefit Supplement, a “cash balance” plan with guaranteed minimum earnings based on 30-year U.S. bonds. The bill that made CalSTRS a hybrid plan (the DBS receives funds from summer school and some short-term pay raises) emerged from a back-room deal and went directly to the legislative floors, bypassing committee hearings. A half dozen small CalSTRS benefit increases were enacted around 2000, including a longevity bonus that expired three years ago. Unlike most state and local government workers, teachers do not receive Social Security in addition to their pensions. The benefit increases around 2000 did affect solvency. An annual actuarial report last April said if CalSTRS were still operating under the 1990 benefit structure, the plan would be 88 percent funded instead of 67 percent funded. “In the future, we advise policymakers to avoid changing pension contributions or benefits based on any short period of strong investment gains,” the nonpartisan Legislative Analyst’s Office said in a report on CalSTRS funding last year. Teachers hold a strong hand in rate-hike talks. A CalSTRS legal opinion argues that the teacher contribution, 8 percent of pay, is a “vested right” protected by the same court rulings said to bar pension cuts unless offset by a new benefit of comparable value. Some suggest a routine 2 percent cost-of-living adjustment, given now at the discretion of the Legislature, could be permanently guaranteed to offset an increase in the teacher contribution rate of 2 percent of pay or more. The governor’s proposed budget said “school districts and community colleges should anticipate absorbing much of any new CalSTRS funding requirement” because retirement benefits are part of compensation. At a legislative hearing last year, there was a disagreement on whether an increased school contribution to CalSTRS would be covered by Proposition 98, a minimum guarantee of state funds that provide most of the money for schools. The Legislative Counsel said requiring schools to contribute more to CalSTRS would trigger an offsetting increase in Proposition 98, in effect passing the cost to the state. But the state attorney general was said to disagree. The state directly contributes $1.4 billion to CalSTRS this fiscal year. Half the amount, roughly 2.5 percent of pay and increasing slightly in recent years, goes to the troubled pension fund. The state contributed 4.6 percent of pay until a cut began in 1997. The other half of the current state contribution, another 2.5 percent of pay, goes to the Supplemental Benefit Maintenance Account to keep pension payments to long-time retirees from dropping below 80 to 85 percent of their original purchasing power. While the main pension fund is said to be running out of money, the SBMA has a large and growing reserve, $9.3 billion in the latest annual financial report. Officials have said the supplemental payments are vital and a healthy reserve is a necessary safeguard. The analyst said school districts could have the flexibility to provide different pension options to meet local needs, local officials could make decisions and be held accountable, and the state would reduce a long-term fiscal risk. “A shift to local control of CalSTRS likely would require giving the system the authority to set and adjust district contributions,” said the analyst’s report. Brown urged more local control of education in his State of the State address last year. He cited the principle of decentralization or as he called it “subsidiarity,” creating a buzz word at the Capitol. This entry was posted on January 13, 2014 at 8:27 am and is filed under Brown, CalSTRS, Funding gap. You can follow any responses to this entry through the RSS 2.0 feed. You can skip to the end and leave a response. Pinging is currently not allowed. Another thorough and timely article, Ed. One minor quibble: state employees (at least in California) actually do get Social Security and even many (I think most) local employees do as well. But, it’s quite true that teachers don’t. I really hope this article does not set in motion another chain of personal attacks. I think your article makes it clear that there are real problems that ultimately, and the sooner the better, need to be addressed. It also shows how complicated an painful any solution will be. Mr. Genest, I must disagree with your comment concerning Social Security benefits. While I’m not sure how many state employees receive SS, I don’t believe state Public Safety does. As for Social Security benefits at the local city level, and this benefit is different for each city depending if they opted out (when that was an option), only about 15% of cities provide both pensions & Social Security benefits (based on a small sampling size). I don’t think any current public safety employees receive the benefit. I think all government employees in California can receive Social Security and a pension if they work the required number of quarters outside of local & State government, and that includes teachers. For some the Social Security benefit is reduced, or modified, when you receive both. At least that’s how I understand it. All employees pay their share of the Medicare contribution. Great job, Mr. Mendel. An extremely important topic with many great points in need of cosideration and discussion. If CalStrs were to be given money equal to its current unfunded pension liabilities, those additional assets would be assumed to be able to earn at the discount rate used of 7.5%. Why then are the unfunded liabilities” annual interest carrying cost not the same, which would be greater than $4.5 billion? Is the $4.5 billion a year a function of paying less now but more later than would be necessary if full interest payments were made? But the pension liability debt is past compensation that was not paid for as it was earned. So to the degree that paying for it going forward results in a reduction of current and future employee compensation and/or what current and future taxpayers receive in services from those government employees, the recipients of that past compensation and those who are paying for it will not be a function of the contemporary compensation of employees for what they do. It seems to me the evidence is pretty overwhelming that democracies tend to result in politicians who will spend and make financial promises to people that they are unwilling to require that current taxpayers fund. Given that, shouldn’t we require that government employee compensation all be paid when it is earned? That would set up the necessary political faction tensions between what politicians want to give to some and the people who will be required to pay for it. Furthermore defined contribution compensation is fully knowable while defined benefit compensation is a function of predictions that will inevitably be rosy, hence the actual compensation cost can’t be known. Sounds as if the guilt can be apportioned one-third past taxpayers, and two-thirds past and future retirees. So how come no one proposes apportioning the pain that way? In union-power states such as NY and California, the unions are more guilty but others suffer. In other states such as New Jersey, past taxpayers are more guilty, but most of the burden is shifted to the workers. I find this troubling. As with CalPERS, CalSTRS increased benefits in a multitude of ways and the justification is: “no fiscal effect to the General Fund.” My first thought is deferring debt by increasing pension benefits has little effect on the general fund initially. It is the politicians way of increasing compensation/benefits without paying the cost – by deferring the debt. IT SHOUDN”T HAVE MATTERED IF INCRESED BENEFITS IMPACTED THE GENERAL FUND OR NOT. THEY INCREASE THE UNFUNDED LIABILITY – OR TAXPAYER OBLIGATION – IMMEDIATELY. If the PENSION plan is above 100 percent funded the excess funding belongs to the taxpayers. Apparently the Teachers Union, Like the CalPERS unions, just considers excess earnings as their money. In the opinion of the unions or their paid for politicians, excess earnings only represent an opportunity to increase pay or benefits. – supplemental benefit programs which are in addition to pensions, with guaranteed rates of returns, which also probably guarantee rates of return even when CalSTRS loses money – costing taxpayers money. -diverting 25% of employee funding toward supplemental benefits, meaning that employees only contributed 75% of their required contribution between 2001-2011, even though their benefits were increased and their pension system, CalSTRS, was only earning an average of 2.5% annual returns. – Cost of Living Increases (COLA’s) which aren’t a part of the contract between CalSTRS and the Teachers UNIONS but have been PAID by CalSTRS (and approved by the CA State Legislature) without fail even though the pension system is SEVERELY UNDERFUNDED, is criminal. How do they justify that? And how do they justify that while claiming they need an additional 4.6 billion (understated) from taxpayers? Good list, Captain. If the first 4 had not been done the COLA might have been OK. To my mind, the issue is not Unions… after all, greed is the American way, and Unions are going to organize and fight just like the sharks on Wall Street do. Didn’t Madison in the discussions at the founding of the US count on a balance of terror? The issue is that the actuaries who calculate funded ratios don’t really know what they are doing. Basing any funded ratio on the assumption that stock market gains are smooth is ignorant. Serious historical modeling is doing if investment in stocks is allowed. It is not at all clear what is the right number, but it is clear that the computations done in the late 1990’s were just plain wrong. Of course there is endemic disrespect in the US for knowledge. Well, outside of the really good Wall Street firms that know the score. Ah, Spensions, you are now treading in political/economic theory territory, my favorite! In fact, “greed” is the human way, not just the American way. The founders genius was that they understood that government can not remove greed, evil, etc. from the human tool kit. Instead, they relied on a multitude of free men supervised by a limited government that set basic rules of law and then stood back. (Of course, they also knew that a democratic republic depends on a believe in God, but that’s another story). A balance of power does not always lead to the best outcome, but over time, it is a more effective way of achieving the greatest good for the greatest number than any other, as long as there is a rule of law to keep the “game” more or less fair. The problem with public pension unions is that they play in the political arena and thereby end up hiring their own bosses. There needs to be a countervailing force brought back in to that equation. Plenty of other interest groups play in the same arena… loose associations of millionaires and billionaires, not to mention not a few faith-based groups. I’m not defending unions but I am pointing out that they aren’t singular… so the countervailing forces exist already. Who has no representative in that arena? Good honest people who work hard and play by the rules. Good article and interesting where Jerry is telegraphing his direction. I think the lesson here is that nothing stays constant forever. Predictions made in the 1990’s were blown out of the water by 2008. Predictions made today about 30 years from now will look just as silly. As accounting rules change and requirements change and the expectations of the public change, you must also change with the times or it will be a rude awakening. I think it would be appropriate for CalSTRS to set their employer rates just like CalPERS does. Ultimately, it is up to the employer to decide if they can afford something or not. That to me brings the issues back to the citizens (you know, representative Democracy) and as Tip O’Neil used to say, “all politics is local”. This is good that citizens will have to recognize once again that it is “their” “our” country even at the school district. Time to pay attention…I know I know, you are so broke you can’t afford to “pay attention”. You mean you think it’s appropriate to give CalSTRS the authority to increase employer/district/taxpayer cost, which amounts to a substantial payroll tax, based on CalSTRS inability to manage their own fund because they’ve increased unfunded liabilities by enriching their members, while cheating taxpayers? In my opinion we should change the rules for CalPERS thereby forcing them to get voter approval, or at least legislative approval, for all future rate increases. Both CalSTRS & CalPERS get an “F” for their continued failures that have created the mess the public will soon understand. I think it’s a shame that CalSTRS has had such a HUGE role in the not to distant destruction of our school budgets. Shameful! Mike Genest Says: “Ah, Spensions, you are now treading in political/economic theory territory, my favorite! In fact, “greed” is the human way, not just the American way. The founders genius was that they understood that government can not remove greed, evil, etc. from the human tool kit. Instead, they relied on a multitude of free men supervised by a limited government that set basic rules of law and then stood back. (Of course, they also knew that a democratic republic depends on a believe in God, but that’s another story). A balance of power does not always lead to the best outcome, but over time, it is a more effective way of achieving the greatest good for the greatest number than any other, as long as there is a rule of law to keep the “game” more or less fair. Thank you, Mr Genest, for those comments. I agree. Captain, are you saying there is an absence of countervailing forces? I receive 50% of social security because I have a pension.